Bryce Harper walks off the field at Dodger Stadium with Washington manager Davey Johnson and a trainer May 13. The Washington Nationals have placed outfielder Bryce Harper on the 15-day disabled list, as the club's youngest star continues to deal with the effects of running into the outfield wall at Dodger Stadium in Los Angeles earlier this year. 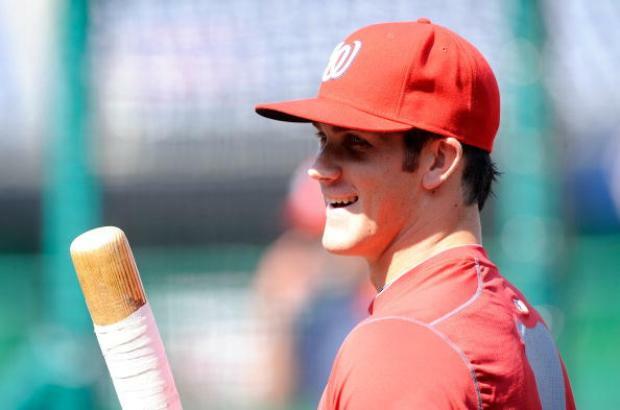 The news that the Nationals planned to place Harper on the disabled list was first reported by The Washington Times and was later corroborated by CSN Washington and CBS Sports. The move corresponds with the promotion of right-handed pitcher Erik Davis from AAA Syracuse, which the club announced late Friday following Washington's 3-2 win over the Atlanta Braves. Harper has not played since May 26, when he went 1-for-3 with a walk in the Nats' 6-1 win over Philadelphia. The move is retroactive to May 27, Harper would be eligible to return June 12. Officially, the 20-year-old is dealing with bursitis in his knee, which has been an issue since Harper collided with the fence while tracking a fly ball May 13. In all, Harper has played in 9 games and started 8 since the collision, going 7-for-31 (.226) with three extra-base hits, including two home runs. For the season, Harper is batting .286 with a .386 on-base percentage and a .587 slugging percentage. He has hit 12 home runs and driven in 23 runs. For his part, the 26-year-old Davis has appeared in 21 games at Syracuse this year, posting a 1-2 record and a 3.00 ERA. He has also struck out 27 batters in 24.0 innings of work for a 10.1 strikeout-per-9-innings ratio. The Nationals were scheduled to continue their series with the Braves Saturday at 7:15 p.m.